Inc VAT is correct if you purchase your goods inside EU.  If you are outside EU, please click the Inc VAT text to see the price without VAT. If you are outside EU local VAT may apply when the shipment enters your country. This amount is not included in the above amount. Audio Reference Clock with special low noise voltage regulator, 47 femto second RMS jitter and essential functions of the high end, Neutron Star Clock. A reference Clock is installed inside an audio player, and will have the effect of cleaning up the sound stage. This means the sound stage will spread out correctly, and make it easy for you to feel where the instruments and artists are placed. It essentially turns music from background noise to a living experience. 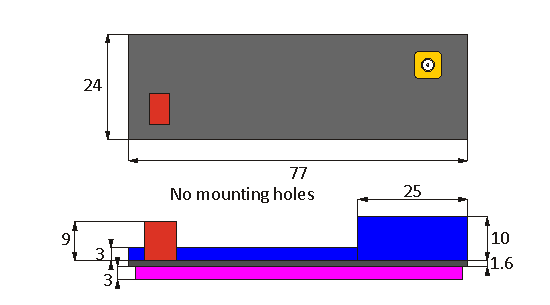 Most CD / DVD and network players are equipped with a noisy clock from factory, running on the same power rail as the rest of the electronics. This will give a narrow and blurry soundstage. Kind of like if the whole band in your music were standing inside a phonebooth, and you were trying to listen outside. You cannot pinpoint if the drums are in front or back. So there is potential for improvement. A reference clock is step #1 in upgrading a CD / DVD or Network player, to reach clean and live sound, which will let you really enjoy the music instead of turning it down. A clock and a few other upgrades will turn any CD player sounding like a true high end CD player. And the same applies to DVD and Network players. An upgrade like this, is by far the cheapest way to achieve true high end sound. Each Neutrino clock is meticulously adjusted to the correct frequency, within a few Hz. New type of Voltage Regulator. In our previous regulators we have used the LM329, one of the best voltage references, when it comes to low frequency noise. However LM329 requires at least 8V to function, including the current mirror. This is fine for most installations, but from time to time, a lower voltage can be beneficial, and make the regulator less sensitive to ripple noise. So this time we were looking for a reference with lower base voltage, but the same exceptional noise performance, and we found it in a green LED. The LED has very good noise performance, in the lower corners of the frequency spectrum, where capacitor decoupling will not do any good. The resulting noise of this voltage regulator, is as good as the LM329 based regulators, but with fewer components, and smaller footprint. While an LED is an optimal choice when it comes to low frequency noise, it has less temperature stability, and a relatively high dynamic impedance, compared to a real reference, making it less capable of blocking input noise. So we had to think out a circuit where these shortcomings would not become the bottleneck for overall performance. The LED will decrease it's standoff voltage by about 2mV per deg K, causing the reference voltage to drift with temperature. To counteract this drift we paired the LED up with another component with the opposite temperature coefficient. The result is only a small drift over the entire temperature range. (See red curve below). One of the differences between Neutron Star and Neutrino is the latter has no 'Crystal Oven' keeping the crystal and oscillator at a constant temperature. The Neutron Star clock will stay stable over the entire temperature range, because it keeps the critical circuits heated to a constant temperature of about 40 degrees C. Neutrino doesn't have this feature, which is one of the reasons for the smaller size. However as you see, it's still pretty stable, and keeping within about 70 Hz (for a 16.9344 MHz clock - see blue curve above), over the temperature range. This is a deviation of only 4 ppm. 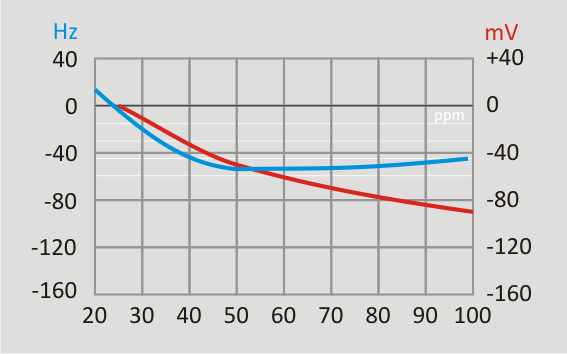 The spec for a standard CD player clock is 50ppm, which is equal to a deviation of 800 Hz. So the Neutrino is still 10-12 times better than the standard clock, on frequency stability. You can argue if this parameter has any impact on the sound, as the frequency only effects the playback speed in a very very small amount. 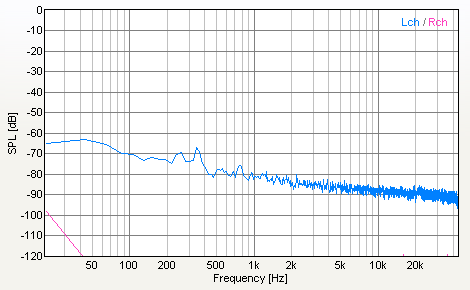 What is more important for the sound is to maintain low jitter, or time deviation noise. Comparable to the good old days where a good LP player had a heavy turntable, to keep a steady pace. On this parameter the Neutrino excels over a standard clock, and even meets all parameters of some of the best clocks available. The Neutrino Clock uses a Colpitts oscillator, famous for low noise, and usually found in sensitive receiver equipment. This type of oscillator does not transfer power rail noise to the clock phase, like a standard oscillator based on the simpler and more noisy Pierce type 'inverter' oscillator. 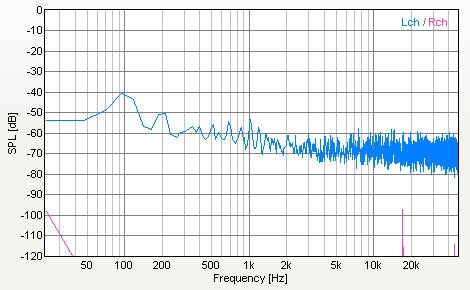 Phase Noise of a typical good quality CD player. Notes on socalled Femtosecond Clocks, and clocks with Femtosecond Jitter performance. A new breed of audio clocks are emerging on the market claiming jitter performance as low as two digit femtoseconds, like 50 or 70 femtoseconds. (1 pS = 1000 femto seconds). Femtoseconds looks like a ground breaking performance but his does not have to do with a spectacular new technology for building clocks, but rather the way jitter is measured. As you see from the curves above the jitter is lower at higher frequencies. 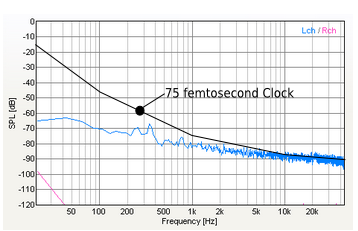 The jitter in 'femtosecond' clocks are usually measured from 12 kHz to 20 MHz, so mostly out of the audio band. This gives a very nice low jitter figure on paper, however it does not necessarily measure sound quality. As an example we have plotted below the performance of a 75 femtosecond jitter (very good) standard clock module, on top of the jitter of the Neutrino Clock for comparison. At 100 Hz the '75 femtosecond Jitter clock' has about 10 times more jitter than Neutrino. The CD player used for this phase noise test is a midrange model, with a sticker price of around 800 US. The test result of heavier CD models, we expect would be more or less the same, unless they incorporate a separate reference clock. The noise measured here is cycle to cycle jitter, and the noise is amplified 1000 times (60 dB). So - 100 dB is really -160 dB of a full cycle. In this case the Neutrino Clock is about 15-20 dB better (~10x) in noise performance, compared to the original CD player. The same result can be achieved in your modern day network player, and thus the sound can be improved significantly. Many clocks have a direct connected clock output, with reference to power supply GND. While this might seem like an obvious solution, there is a problem. Either you are bound to make a double connection loop, when you connect GND of you clock output and GND of the power supply to the clock, and these two points are already connected through a different path in the circuit board, possibly with some noise sources along the way. OR the power supply GND return current will be fed to, and inject noise into the clock GND point. Slightly less harmful, but none of these is really good. Some solution was needed, therefore we came up with the isolated clock injection point. This means the power supply GND and clock signal GND are isolated from each other up to 1500V DC. This way power supply noise is kept in the power supply, and not transferred to the clock signal. The actual transformers are tiny toriod's, inside an SMD package. Accuracy at 25 deg C: +/- 1ppm. Accuracy from 20 to 50 deg C: +1/-5 ppm. Jitter: 1.0pS RMS (10 Hz - 50 kHz range). Jitter: 47 femto Sec RMS (12 kHz - 20 MHz range. Power Supply Requirements: 9.00 - 24.00 Volts DC 20 mA. 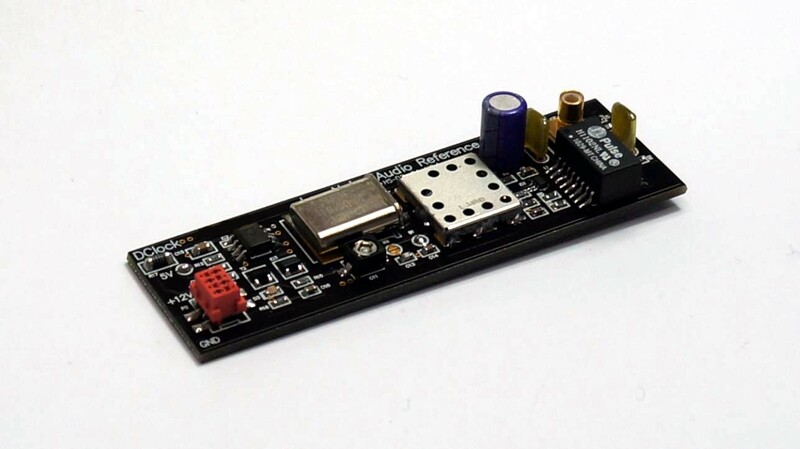 Onboard is a voltage setting, to make the Neutrino compatible with any 3.3V or 5V host circuit. This voltage refers to the - approximate - amplitude of the clock signal (Vpp), that comes out of the clock connector. If the host IC (the IC receiving the clock signal) runs on 5V, then use the 5V setting. 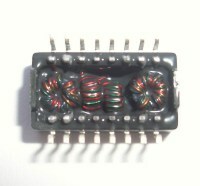 If the IC runs on 3.3V obviously you will overload the input with a 5V signal, as it is higher than the supply rails. In that case us 3.3V. (Most newer circuits use 3.3V). Simply apply solder to the bubble marked '5V' (found just next to the red power connector) to set the voltage regulator at 5V, otherwise it's 3.3V. You may notice the diode connected across the output of Neutrino clock, this diode is required when replacing a 4 pin CMOS crystal oscillator with the Neutrino clock. The CMOS oscillator output signal is 0 - 5V, and the diode displaces the Neutrino's clock to approximately 0 - 5V. Like 0 people like this.